The mandate of Jesus Christ is to: “make disciples” throughout the world. This begins by making Jesus Christ and His saving grace known to others. Events, resources, outreaches, speaking, teaching, and training opportunities are designed to help non-Christians come to faith alone in Jesus Christ for the glory of God and then to grow to become fully obedient worshippers of God. 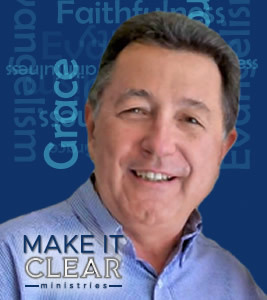 The daily broadcasts of Make It Clear on radio in Honolulu, in San Antonio, and in Orlando; and the 24/7 accessibility on our website www.makeitclear.org of the sermons of Dr. Stan Ponz, provide people locally, nationally, and globally the opportunity to hear Biblically sound messages from God’s Word. Literature is available for explaining the message of salvation like the tracts, “Why Didn’t Someone Tell Me?” (English and Chinese) , “A Christmas to Remember” and “Who Killed Christ?”; the booklet for new believers, “Now That You Believe”; and for spiritual life development, the quarterly devotional booklet, “The Word for You Today” that is received by people from all walks of life here and in other countries. Stan’s sermons on many of the books of the Bible, Biblical topics, and series are available for free download from the website. Stan and Carol are continually being invited as guest teachers and speakers in Churches, Bible Colleges, Seminaries, and Conferences in America, Asia, the Pacific islands, Mongolia, the Caribbean, and Europe. 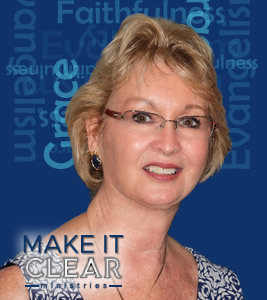 Fulfilling the purpose of Make It Clear Ministries cannot be done alone. To accomplish this, it must have qualified and approved committed men and women who share the same purpose and live it in their own lives and ministries. These pastors are planting churches, rebirthing “dead” churches, and fulfilling the mission of Make It Clear Ministries. They are identified as Make It Clear Associates and are eligible to receive support through Make It Clear Ministries. There is a great need not only locally and nationally, but also internationally to train church and ministry planters in accurate Bible doctrine, preaching and teaching skills, evangelism / discipleship outreach, and how to multiply church planting. Make It Clear Ministries is endeavoring to do this on each continent. By working to educate Florida Bible College students through its missions and pastoral concentrations, graduates will be establishing churches and ministries in America and around the world.